Local businesses make our community what it is. Small Business Monthly (SBM) supports professional growth in the St. Louis area and features many different awards on an annual basis. MT & Associates was honored this year to win two special awards from SBM. Our president, Shelly Tisius, won the Best Boss award published in the August 2017 edition of SBM. The second one has been published this September: Future 50 Small Businesses in St. Louis. 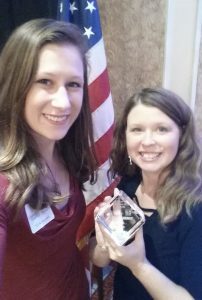 On June 29th, 2017, we were informed that we have been awarded as one of the Small Business Monthly (SBM) Future 50 Companies, which is their “annual search for the 50 fast-growing, top small companies in St. Louis.” We were honored with an award and luncheon on August 16th. Here at MT&A we recognize the responsibility we have toward our customers. On a daily basis, people are frustrated by a lack of customer service in restaurants, phone companies, clothing stores, and, yes, sign language interpreting services. We see this as an issue when interpreters are simply placed on a job because on paper they are qualified for the job. But are they the best experienced interpreter for this specific job? SBM did not award these 50 businesses because of their cheap products and customer numbers. Instead, each article focuses on how services are performed and why the business is important. Go Google “cheap running shoes.” You will find $10 generic sneakers easy on your wallet. Now try running in them for 20 miles, 40, 60. Within weeks you will likely experience shin splints, blisters, or knee pain. Trust me, it’s not worth it. Recently, I convinced a friend to get Brooks running shoes to replace her cheap ones. She had been experiencing shin pain. Only a week after switching to $100 running shoes, she expressed, “They are perfectly conformed to my feet and the arch fits like the shoe is part of me!” She has not experienced any more pain since the change. Shoes are important, but what about the quality of communication? How much more important is communication without which the world would not function! Consider the quality of your sign language interpreters. But perhaps even more important from the start, hire a reputable sign language interpreting firm who gets to know your needs specifically and works unceasingly to customize your communication experience.